The frontal lobe is the largest of the four major lobes of the brain in mammals, and is located at the front of each hemisphere (in front of the parietal lobe and the temporal lobe). It is separated from the parietal lobe by a groove between tissues called the central sulcus, and from the temporal lobe by a deeper groove called the lateral sulcus (Sylvian fissure). The most anterior rounded part of the frontal lobe (though not well-defined) is known as the frontal pole, one of the three poles of the cerebrum. Not to be confused with Prefrontal cortex. The frontal lobe is covered by the frontal cortex. The frontal cortex includes the premotor cortex, and the primary motor cortex – cortical parts of the motor cortex. The front part of the frontal lobe is covered by the prefrontal cortex. There are four principal gyri in the frontal lobe. The precentral gyrus, is directly anterior to the central sulcus, running parallel to it and contains the primary motor cortex, which controls voluntary movements of specific body parts. Three horizontally arranged subsections of the frontal gyrus are the superior frontal gyrus, the middle frontal gyrus, and the inferior frontal gyrus. 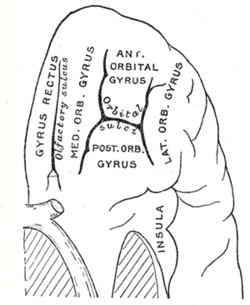 The inferior frontal gyrus is divided into three parts – the orbital part, the triangular part, and the opercular part. The frontal lobe contains most of the dopamine neurons in the cerebral cortex. The dopaminergic pathways are associated with reward, attention, short-term memory tasks, planning, and motivation. Dopamine tends to limit and select sensory information arriving from the thalamus to the forebrain. Animation. Frontal lobe (red) of left cerebral hemisphere. The frontal lobe is the largest lobe of the brain and makes up about a third of the surface area of each hemisphere. On the lateral surface of each hemisphere, the central sulcus separates the frontal lobe from the parietal lobe. The lateral sulcus separates the frontal lobe from the temporal lobe. Lateral part: lateral part of the superior frontal gyrus, middle frontal gyrus, inferior frontal gyrus. Polar part: Transverse frontopolar gyri, frontomarginal gyrus. Orbital part: Lateral orbital gyrus, anterior orbital gyrus, posterior orbital gyrus, medial orbital gyrus, gyrus rectus. Medial part: Medial part of the superior frontal gyrus, cingulate gyrus. The gyri are separated by sulci. E.g., the precentral gyrus is in front of the central sulcus, and behind the precentral sulcus. The superior and middle frontal gyri are divided by the superior frontal sulcus. The middle and inferior frontal gyri are divided by the inferior frontal sulcus. In humans, the frontal lobe reaches full maturity around the late 20s, marking the cognitive maturity associated with adulthood. A small amount of atrophy, however, is normal in the aging person’s frontal lobe. Fjell, in 2009, studied atrophy of the brain in people aged 60–91 years. The 142 healthy participants were scanned using MRI. Their results were compared to those of 122 participants with Alzheimer's disease. A follow-up one year later showed there to have been a marked volumetric decline in those with Alzheimer's and a much smaller decline (averaging 0.5%) in the healthy group. These findings corroborate those of Coffey, who in 1992 indicated that the frontal lobe decreases in volume approximately 0.5%–1% per year. The entirety of the frontal cortex is the action cortex. It is devoted to action of one kind or another: skeletal movement, ocular movement, speech control, the expression of emotions. In humans, the largest part of the frontal cortex (PFC) is responsible for internal, purposeful mental action that we call reasoning or Prefrontal Synthesis. The frontal cortex is the “action” cortex, much as the posterior cortex is the “sensory” cortex. The function of the PFC involves the ability to project future consequences resulting from current actions. PFC functions also include override and suppression of socially unacceptable response as well as differentiation tasks. The PFC also plays an important part in integrating longer non-task based memories stored across the brain. These are often memories associated with emotions derived from input from the brain's limbic system. The frontal lobe modifies those emotions to generally fit socially acceptable norms. Psychological tests that measure frontal lobe function include finger tapping (as the frontal lobe controls voluntary movement), the Wisconsin Card Sorting Test, and measures of language and numeracy skills. Damage to the frontal lobe can occur in a number of ways and result in many different consequences. Transient ischemic attacks (TIAs) also known as mini-strokes, and strokes are common causes of frontal lobe damage in older adults (65 and over). These strokes and mini-strokes can occur due to the blockage of blood flow to the brain or as a result of the rupturing of an aneurysm in a cerebral artery. Other ways in which injury can occur include head injuries such as traumatic brain injuries incurred following accidents, diagnoses such as Alzheimer's disease or Parkinson's disease (which cause dementia symptoms), and frontal lobe epilepsy (which can occur at any age). Common effects of damage to the frontal lobe are varied. Patients who have experienced frontal lobe trauma may know the appropriate response to a situation but display inappropriate responses to those same situations in "real life". Similarly, emotions that are felt may not be expressed in the face or voice. For example, someone who is feeling happy would not smile, and the voice would be devoid of emotion. Along the same lines, though, the person may also exhibit excessive, unwarranted displays of emotion. Depression is common in stroke patients. Also common is a loss of or decrease in motivation. Someone might not want to carry out normal daily activities and would not feel "up to it". Those who are close to the person who has experienced the damage may notice changes in behavior. This personality change is characteristic of damage to the frontal lobe and was exemplified in the case of Phineas Gage. The frontal lobe is the same part of the brain that is responsible for executive functions such as planning for the future, judgment, decision-making skills, attention span, and inhibition. These functions can decrease drastically in someone whose frontal lobe is damaged. Consequences that are seen less frequently are also varied. Confabulation may be the most frequently indicated "less common" effect. In the case of confabulation, someone gives false information while maintaining the belief that it is the truth. In a small number of patients, uncharacteristic cheerfulness can be noted. This effect is seen mostly in patients with lesions to the right frontal portion of the brain. Another infrequent effect is that of reduplicative paramnesia, in which patients believe that the location in which they currently reside is a replica of one located somewhere else. Similarly, those who experience Capgras syndrome after frontal lobe damage believe that an identical "replacement" has taken the identity of a close friend, relative, or other person and is posing as that person. This last effect is seen mostly in schizophrenic patients who also have a neurological disorder in the frontal lobe. In the human frontal cortex, a set of genes undergo reduced expression after age 40 and especially after age 70. This set includes genes that have key functions in synaptic plasticity important in learning and memory, vesicular transport and mitochondrial function. During aging, DNA damage is markedly increased in the promoters of the genes displaying reduced expression in the frontal cortex. In cultured human neurons, these promoters are selectively damaged by oxidative stress. Individuals with HIV associated neurocognitive disorders, accumulate nuclear and mitochondrial DNA damage in the frontal cortex. A report from the National Institute of Mental Health says a gene variant of (COMT) that reduces dopamine activity in the prefrontal cortex is related to poorer performance and inefficient functioning of that brain region during working memory tasks, and to a slightly increased risk for schizophrenia. In the early 20th century, a medical treatment for mental illness, first developed by Portuguese neurologist Egas Moniz, involved damaging the pathways connecting the frontal lobe to the limbic system. A frontal lobotomy (sometimes called frontal leucotomy) successfully reduced distress but at the cost of often blunting the subject's emotions, volition and personality. The indiscriminate use of this psychosurgical procedure, combined with its severe side effects and a mortality rate of 7.4 to 17 per cent, gained it a bad reputation. The frontal lobotomy has largely died out as a psychiatric treatment. More precise psychosurgical procedures are still used, although rarely. They may include anterior capsulotomy (bilateral thermal lesions of the anterior limbs of the internal capsule) or the bilateral cingulotomy (involving lesions of the anterior cingulate gyri) and might be used to treat otherwise untreatable obsessional disorders or clinical depression. Single-symptom theories, which propose that a specific dysexecutive symptom (e.g., confabulation) is related to the processes and construct of the underlying structures. Stuss (1999) suggests a differentiation into two categories according to homogeneity and heterogeneity of function. Rolls's stimulus-reward approach and Stuss's anterior attentional functions (Burgess & Simons, 2005; Burgess, 2003; Burke, 2007). It may be highlighted that the theories described above differ in their focus on certain processes/systems or construct-lets. Stuss (1999) remarks that the question of homogeneity (single construct) or heterogeneity (multiple processes/systems) of function "may represent a problem of semantics and/or incomplete functional analysis rather than an unresolvable dichotomy" (p. 348). However, further research will show if a unified theory of frontal lobe function that fully accounts for the diversity of functions will be available. Many scientists had thought that the frontal lobe was disproportionately enlarged in humans compared to other primates. This was thought to be an important feature of human evolution and seen as the primary reason why human cognition differs from that of other primates. However, this view has since been challenged by neuroimaging studies. Using magnetic resonance imaging to determine the volume of the frontal cortex in humans, all extant ape species and several monkey species, it was found that the human frontal cortex was not relatively larger than the cortex of other great apes but was relatively larger than the frontal cortex of lesser apes and the monkeys. The higher cognition of the humans is instead seen to relate to a greater connectedness given by neural tracts that do not affect the cortical volume. This is also evident in the pathways of the language network connecting the frontal and temporal lobes. ^ Muzio, Bruno Di. "Frontal pole | Radiology Reference Article | Radiopaedia.org". radiopaedia.org. ^ a b Carpenter, Malcolm (1985). Core text of neuroanatomy (3rd ed.). Williams & Wilkins. pp. 22–23. ISBN 0683014552. ^ Giedd JN, Blumenthal J, Jeffries NO, et al. (October 1999). "Brain development during childhood and adolescence: a longitudinal MRI study". Nature Neuroscience. 2 (10): 861–3. doi:10.1038/13158. PMID 10491603. ^ Fjell AM, Walhovd KB, Fennema-Notestine C, et al. (December 2009). "One-year brain atrophy evident in healthy aging". The Journal of Neuroscience. 29 (48): 15223–31. doi:10.1523/JNEUROSCI.3252-09.2009. PMC 2827793. PMID 19955375. ^ Coffey CE, Wilkinson WE, Parashos IA, et al. (March 1992). "Quantitative cerebral anatomy of the aging human brain: a cross-sectional study using magnetic resonance imaging". Neurology. 42 (3 Pt 1): 527–36. doi:10.1212/wnl.42.3.527. PMID 1549213. ^ Kimberg DY, Farah MJ (December 1993). "A unified account of cognitive impairments following frontal lobe damage: the role of working memory in complex, organized behavior". Journal of Experimental Psychology. General. 122 (4): 411–28. doi:10.1037/0096-3445.122.4.411. PMID 8263463. ^ a b c d e Stuss DT, Gow CA, Hetherington CR (June 1992). "'No longer Gage': frontal lobe dysfunction and emotional changes". Journal of Consulting and Clinical Psychology. 60 (3): 349–59. doi:10.1037/0022-006X.60.3.349. PMID 1619089. ^ Rowe AD, Bullock PR, Polkey CE, Morris RG (March 2001). "'Theory of mind' impairments and their relationship to executive functioning following frontal lobe excisions". Brain. 124 (Pt 3): 600–16. doi:10.1093/brain/124.3.600. PMID 11222459. ^ Robinson RG, Kubos KL, Starr LB, Rao K, Price TR (March 1984). "Mood disorders in stroke patients. Importance of location of lesion". Brain. 107 (1): 81–93. doi:10.1093/brain/107.1.81. PMID 6697163. ^ Durani, Shiban K.; Ford, Rodney; Sajjad, S. H. (September 1991). "Capgras syndrome associated with a frontal lobe tumour". Irish Journal of Psychological Medicine. 8 (2): 135–6. doi:10.1017/S0790966700015093. ^ Zhang Y, Wang M, Li H, Zhang H, Shi Y, Wei F, Liu D, Liu K, Chen D (June 2012). "Accumulation of nuclear and mitochondrial DNA damage in the frontal cortex cells of patients with HIV-associated neurocognitive disorders". Brain Res. 1458: 1–11. doi:10.1016/j.brainres.2012.04.001. PMID 22554480. ^ "Gene Slows Frontal Lobes, Boosts Schizophrenia Risk". National Institute of Mental Health. May 29, 2001. Archived from the original on 2015-04-04. Retrieved 2013-06-20. ^ Ogren K, Sandlund M (2007). "Lobotomy at a state mental hospital in Sweden. A survey of patients operated on during the period 1947-1958". Nordic Journal of Psychiatry. 61 (5): 355–62. doi:10.1080/08039480701643498. PMID 17990197. ^ (Burgess, 2003, p. 309). ^ (Burgess, 2003, p. 310). ^ (Stuss, 1999, p. 348; cf. Burgess & Simons, 2005). ^ (cf. Burgess & Simons, 2005). ^ a b Semendeferi, K; Lu, A; Schenker, N; Damasio, H (March 2002). "Humans and great apes share a large frontal cortex". Nature Neuroscience. 5 (3): 272–6. doi:10.1038/nn814. PMID 11850633. ^ Friederici, AD (April 2009). "Pathways to language: fiber tracts in the human brain". Trends in Cognitive Sciences. 13 (4): 175–81. doi:10.1016/j.tics.2009.01.001. PMID 19223226. Wikimedia Commons has media related to Frontal lobe.